Balancing a menu that is nutritionally sound, frugal and do-able can be a challenge, and doing it day in and day out, week after week, year after year can leave you in a rut. It’s difficult to get input from the family and complaints can make things get old, fast. I make a big effort to get my family to try all kinds of foods – but I also make an effort to make dinners every one enjoys and eats. We rate recipes and only save the four stars if it has a redeeming quality – very cheap, very easy, etc. We save the five stars, always. How do you keep things fresh, innovative and exciting when you’re constrained by time and budget? Vary the meats/proteins, including some type of beef, some type of poultry and some type of pork and some kind of fish. I’m really working on serving more fish these days! Vary the starches throughout the week to include some type of potato, beans, rice, and noodles or bread. Serve at least two vegetables each night, paying special attention to the healthiest ones and the ones in season. These are usually the most colorful veggies, and generally the least expensive. Try at least one new recipe, whether main dish or side. Have one dessert a week, but I make it homemade. Vary the difficulty and length of time for my recipes – for me, it’s usually one slow cooking or difficult recipe or meal with several very simple ones in the week. Breakfasts and Lunches: As I consider what I’m making for dinner, I keep in mind what we’ll be eating for lunch and breakfast. Often left overs serve as lunch, and breakfasts are pretty simple. If there’s prep work to be done, often I work on it the night before. Sunday: I start with Sunday, a day I often have more time to be in the kitchen. Sunday has always been our “family” night, too – a designated night we spend together, eating and watching a movie, playing games, etc. Sunday is our Big Meat Night, which might be something like a pot roast, stew, ribs, whole chicken, ham, a small turkey – something on sale, probably a loss leader at the store, that feels special and is large enough to generate leftovers for later in the week. If it’s not a larger cut, I consider whether or not what I’m cooking can still be bought back later as a planned left over or used more than once. This gives me a leg up on the cooking. The item is usually something I can turn into a casserole or soup, perhaps, or another meal or even two. It may even be something like a chicken breast dinner with a few extra baked up to make chicken salad later, or a budget priced ground beef with Meatloaf as the main dish, meatloaf sandwiches later and another preparation altogether (Tacos? Chile? Goulash?) a third time. Whatever this item is, beef, pork or poultry, will help determine what else I will serve on the other nights. Family Fun Night: This is one night I make something fun: Tacos or Pizza or appetizers for dinner, or whatever our current favorite dishes are. It could be a “fair” food night or even a “junk night.” It might be crackers, cheese and sausage. Depending on ages, it might just be popcorn and a movie night. This is an idea I stole from an exercise/diet guru – he felt that people often ate better and were able to eat more healthily if they were able to have one day a week when they didn’t have to follow a guideline on a diet. The interesting thing about this is, that the healthier you’re eating the rest of the week, the less likely you and your family will go “nuts” on this night – yet it gets everyone involved, it feels indulgent and maybe even a little wicked – and it’s usually easy! Vegetarian Meal: I always try to work in one healthy vegetarian meal a week, and sometimes more. Think tofu, maybe some type of brown rice bake, a stir fry, a pasta dish. Think wonderful salads, gazpacho or wraps. Other meatless options (perhaps not as healthy) could be potato pancakes and applesauce, pastas, grilled cheese and tomato soup, scrambled eggs or cheese rarebit. Waffles or pancakes can be a good choice, but if I do something like this, I do try to health it up with whole grains of some type. Let your imagination run wild, borrow from other cultures and have fun…unless you mention it’s meatless, your family may not even notice. Smorgasbord Night: Late in the week, we pick and choose our favorite leftovers and reheat or reinvent. I might do some simple putting together, like setting out a sandwich spread, or I might need to fill in a little bit here or there with sides, but basically, it couldn’t be simpler and is a great way to keep things from going to waste. If we don’t have leftovers, this is usually a very simple night with no cook or almost no cook options. Fish Night: Unless fish is featured in another meal, I work in at least one meal featuring fish or seafood. While fish can be a pricier option, it is one option where the potential health benefits outweigh the price. Wild Card Nights: The other two nights, I fill in based on what’s on sale and what I’ve had for the Big Meat night. Usually one night or more is some type of derivation on the big meat we’ve had: a casserole from the leftovers, perhaps a soup or sandwiches using the meat. The other two nights I base on bringing in another type of meat or protein. If big meat night is chicken, then we might have chicken salad for one night, hamburgers one night and pork chops the next. If big meat night is a pork dish, like pulled pork, we might have pulled pork sandwiches again one night, and then chicken another night and some type of fish another. One, or even two of these nights might be something I’ve pulled out of my freezer – a casserole I’ve doubled earlier, for instance. It becomes almost second nature after a while to fill in the blanks on these meals. Look closely at the ads and base your purchases on the sales priced items; don’t necessarily rule out the more expensive items that you might use in smaller quantities for great flavor and variety. Look in the store or ads for something you’ve never tried and build a dinner menu around it. Talk to your kids about what country they are studying in school, and find recipes from that area. Watch the news, and if your family asks about a certain area, look it up and learn about it; find out what the national meals are and find a recipe. Turn on Food Network, visit a blog, look at the magazines at a doctor’s office, or your own magazines. Ask a family member or friend what they’re having for dinner that night, or ask your children what they’ve eaten recently at friend’s houses they particularly liked. Ask your kids what their favorite “hot lunch” item is…make a healthy version! Check out frozen foods your child likes and make them homemade! If you run across someone you’ve met from another area or another country, ask them what their regional favorites are; If you eat at Ethnic restaurants, consider reproducing at home! Check out different markets, farmers markets and groceries – and talk to people! I was at a market once with a relative who got the family recipe for Red Lentils from a native African and other who got a recipe for Red Cabbage from a third generation German family. 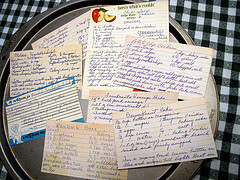 Leaf through your own cookbooks or recipe boxes…I’ve found a lot of inspiration in my grandmother’s cookbooks. Go retro and bring back a childhood favorite of yours or someone else. Watch what’s being advertised on TV ads for restaurants…check out menus, too, for ideas to make at home. These are often favorites that appeal to a broad range of people – and will probably appeal to your family as well. Double and freeze items on your menu when you make them, things like soups, casseroles, lasagna, sloppy joes, taco meat, etc. Prep ahead: If you’re chopping an onion or pepper for one recipe, do the same for the recipe the next night. Cook partial pieces of a recipe early: If you’re making chili later in the week, maybe you could presoak your beans a few days ahead, then cook them while you’re already in the kitchen making another meal so they’re ready to go on the night you want to make the chili. Go ahead and make extra beans and freeze. When you make that Chili, double the hamburger and put half aside or in the freezer for tacos a little later. Make a little extra of items you can have on hand to pack for lunches. Make it a habit to plan your menus and look ahead for ways to save time. Get your spouse, roommates, kids, etc., in the kitchen with you…talk, chat, catch up and cook, and taste a lot…enjoy!